"I want those guppy scales!" 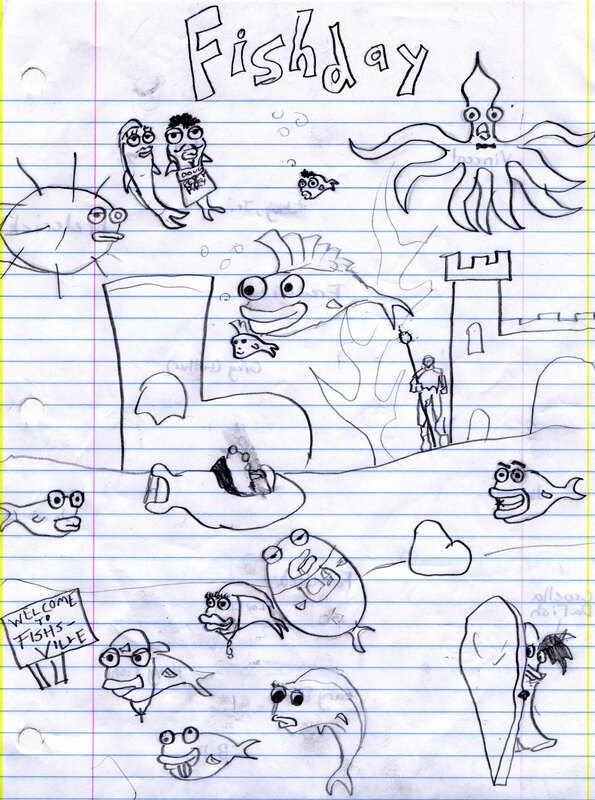 That's right: Freddi, Greg (Luther), Fat Jack, and all the others star in their first real-time story: 101 Dalfishans!!! Cruella DaFish, a mean old lady who is mean and old wants the scales of the all the young guppys for her Fashion Business. It's up to Freddi and Greag (Luther) along with 99 other fishies to stop her!!!! This is the official 101 Dalfishans movie poster!!! 101 Dalfishans is mainly about Cruella DaFish, Freddi, and Greg. The story is as follows: Cruella DaFish is a nasty woman who is the head of FISH (Fashion Is So Hot). Her new idea for a fashion statement is "The Guppy Gown." Sounds pretty, don't it? Anyways, the only problem with Cruella's "Guppy Gown" is that in order to make her dream a reality, she has to use guppy scales. But what does Cruella care? She's a mean old lady!! She don't give a flying fish's tailfins whether the guppys get their scales plucked to death or not!!! So, enjoy the story (when it comes) and HAPPY FISH DAY!!! It was a bright sunny day in Fishsville (even though the sun doesn't reach that far underwater) and everybody was having a good time. At Doug's Peep Fry business was great. Jerry Jamison ran around trying to get as many customers' orders as possible. Fishsville was a small town and almost everybody knew everybody else. "JERRY!!!" Came a call from a table not far away. Jerry turned. There sat Cruella DaFish, a mean old lady who is mean and old and was his wife: Jenny Jamison's boss. It looked like she had given herself a lunchbreak. Typical. "Jerry, dear," Cruella smiled a nasty ugly toothy smile. (Do fish have teeth? Oh well.) "Get me the most expensive thing on this menu, and make it jiffy quick." She handed the menu to Jerry. "Yea. Jiffy quick. Whatever you say, your highness." Jerry walked away. Cruella sneered at his back. While Shillyman was making the peoples legs, Cruella got a call on her shellphone. It was Latasha Froitenburg. She had come up with an amazing new idea for a dress (Cruella being the head of FISH: Fashion Is So Hot and sheloved new dress ideas, especially amazing ones). Cruella said that she would be right there and left right away. Later, when Cruella reached the FISH headquaters, Latasha was in Cruella's office. She was showing Cruella. "Okay, so we'll have ait kind of longer in the front.." "WONDERFUL!" Cruella exclaimed. "I love it! Latasha, you're fired. God, how did I ever come up with this idea?" "But, Mrs. DaFish! I came up with that idea!!" exclaimed Latasha. "Excuse me, but I don't think you work here any more. Sorry honey." Cruella walked toward Latasha, bent down on her desk and butted Latasha out the window. "WAAAAAAAAAAAHHHHHHH!" Latasha called as she fell from the window. When she hit the ground, Cruella heard: "I'll get you, you naughty fish!!!" Cruella smiled. All she needed for the dress now was the guppy scales. It was too easy.